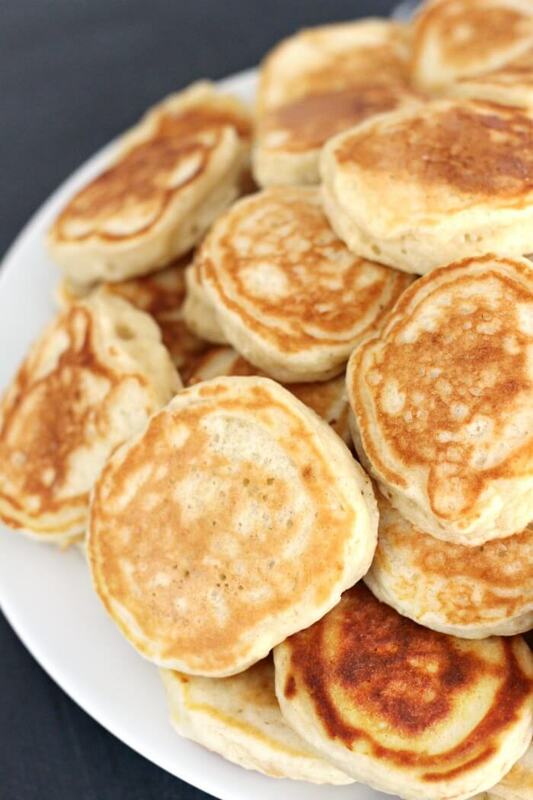 Greek yogurt pancakes are delicious, easy to make, and full of healthy protein to make you feel good about breakfast. Our Greek yogurt pancakes were actually a bit of a happy accident! Aunt Tracey was visiting (remember the bacon parmesan crackers?!) and we ran out of ingredients for regular pancakes, so we raided the pantry and fridge to make these! If you’re paleo or avoiding grains, make sure to check out our paleo pancakes, if you’re not into yogurt we have ricotta pancakes that are delish – and if you’re just wanting something totally decadent, the apple butter swirled pancakes are calling your name! What Makes Fluffy Greek Yogurt Pancakes? 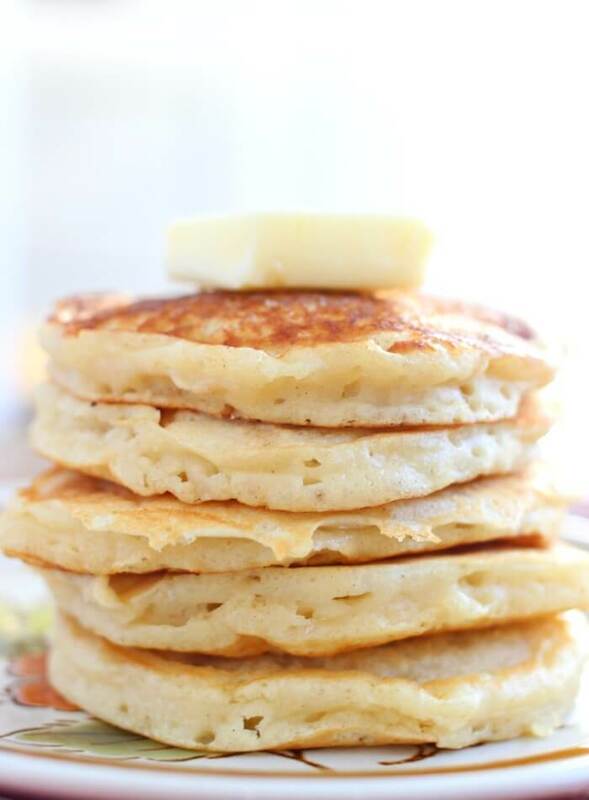 Fluffy pancakes are made by a chemical leavening reaction. 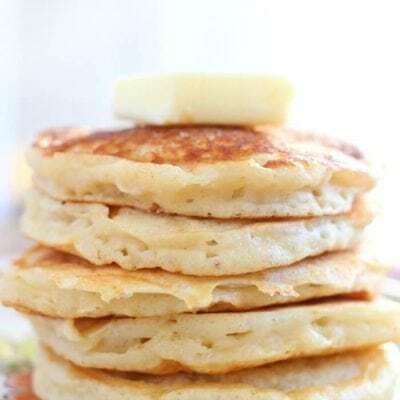 In traditional pancakes it’s done with baking powder, but for these Greek yogurt pancakes we relied on the reaction between baking soda as a base and yogurt as an acid to create light fluffy Greek yogurt pancakes! 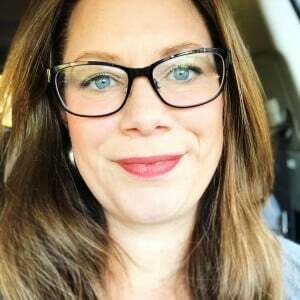 Aunt Tracey is a pharmacist with a chemistry background, so she knew just what to use for the perfect pancakes. The kids ate them up like crazy. We like a full fat vanilla Greek yogurt in our pancake recipe. The full fat yogurt gives these a beautiful creamy texture and the vanilla adds an extra dimension of flavor. There is typically some sugar added to vanilla flavored yogurts, so if you’re watching sugar intake be sure to check the label. You could also try this recipe with plain Greek yogurt (unsweetened) and add your preferred amount of vanilla extract and sugar. This might take a little extra recipe testing! 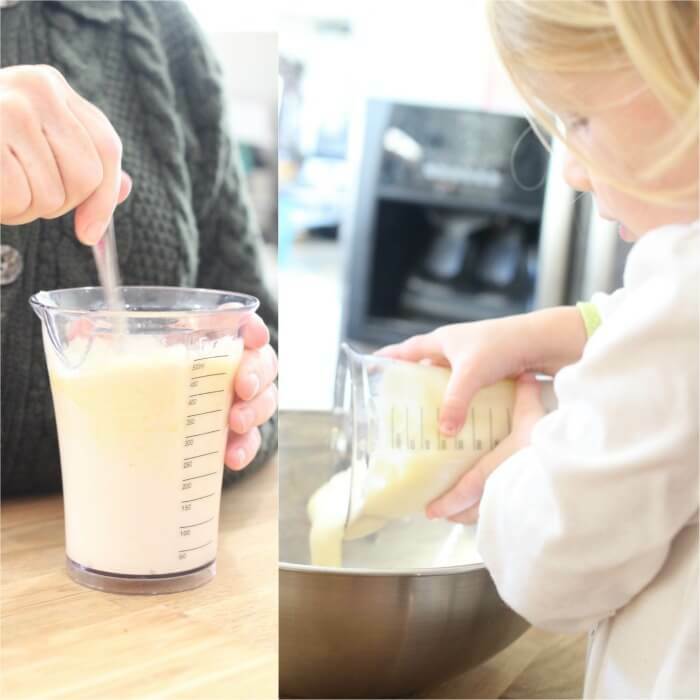 A great pancake recipe is going to include a flour base, a liquid, and a leavening agent (something to make them puffy and fluffy, and light). In our case we’re using some traditional ingredients like wheat flour, and egg, but adding Greek yogurt. Other recipes may call for nut flours and egg substitutes. There are as many delicious pancake recipes as there are people. When it comes down to brass tacks, the best pancake recipe is the one that you love (and your kids won’t gripe about). You can see from the ingredient list, these Greek yogurt pancakes are super filling. 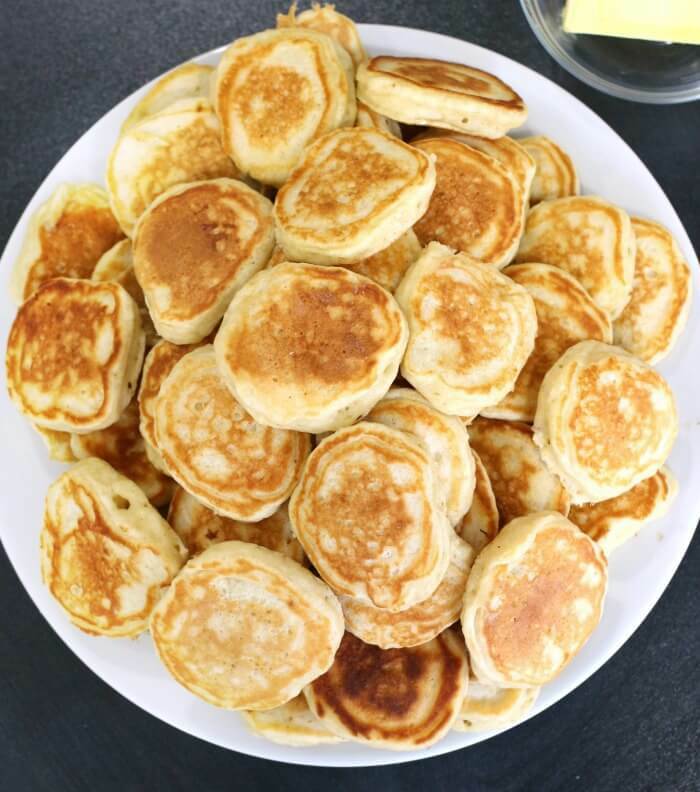 We made them in silver dollar pancake size so we wouldn’t overindulge and also because they’re the perfect size for kid fingers and for dipping! All purpose flour – we used plain white all purpose flour for this recipe. The difference between all purpose flour and self rising flour, is that self rising flour has is a combination of all-purpose flour, baking powder, and salt in it. If you use self rising flour, you’ll want to skip the baking soda and salt in this recipe. Baking soda – We’re using this in combination with the Greek yogurt to create a light and fluffy pancake. Don’t skip it unless you’re using self rising flour. Salt – A little bit of salt goes a long way in waking up your taste buds. Don’t skip this unless you’re using self rising flour. Sugar – Just a touch. Yum. Depending on the sugar content of your yogurt, this can be skipped if you’re watching sugar intake closely. Greek yogurt – The star of the show. We used full fat vanilla Greek yogurt, and strongly suggest you do the same! This will go a long way in keeping you full until lunch time. Egg – The egg works as a binding agent, but also adds more protein to our recipe, which is so important in the morning. Whole milk – Again, more protein and healthy fats to fill you up and keep you full. Butter – I am super partial to a good European butter with lower water content. It will give you more flavor and has a higher butterfat content. Optional toppings – Fresh fruit, butter, maple syrup. Breakfast Pizza – Eggs and salsa and all the yummy for this Huevos Rancheros Breakfast Pizza. My kids were so excited to get pizza for breakfast, they didn’t even realize how healthy it was! Ham and Potato Breakfast Casserole – Absolutely one of my go-to breakfast favorites. This easy breakfast casserole is perfect to make at the beginning of the week and take some of the stress off mornings. It’s freezer friendly too! Baked Pumpkin Oatmeal – Y’all. This pumpkin oatmeal is not just for the holidays. Mmmmmmm. 15″ Cast iron pan – This. Pan. Is. Huge. Literally massive. I have two and they’re sooooooo amazing. I love using these on my grill to make a beautifully seared steak or some yummy Old Bay shrimp. And in my oven or on the stovetop when the weather’s no good for grilling! 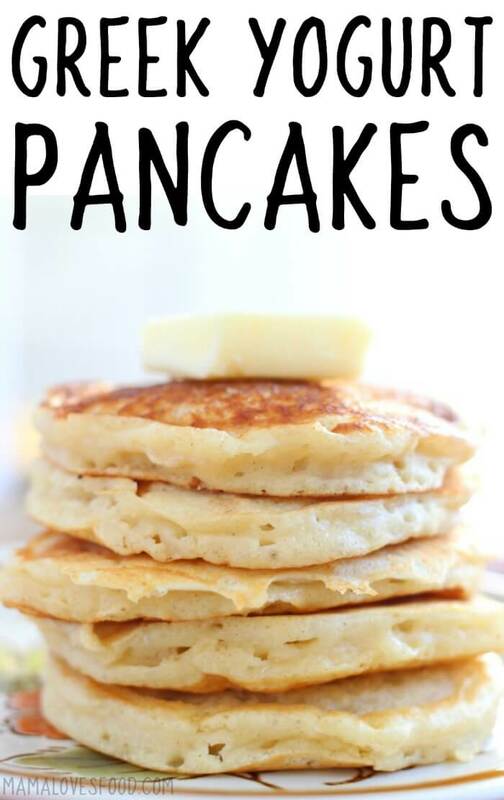 And, of course – for pancakes. Silicone Pancake Flipper – There’s nothing worst than pouring out the perfect pancake and then destroying it in the flip. This tool will help you get perfect pancakes every time. 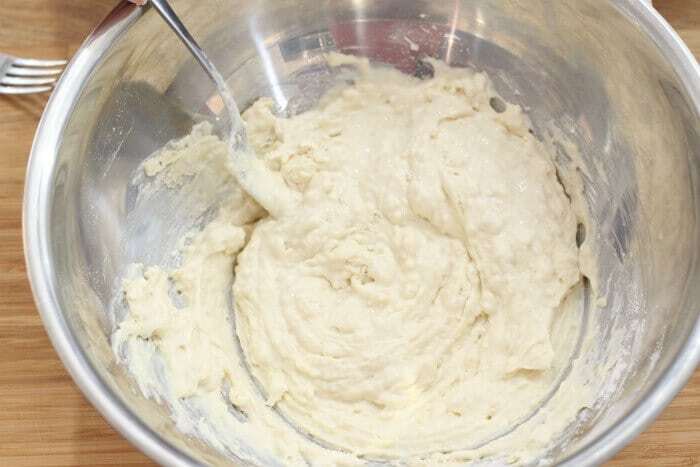 Whisk together dry ingredients in one bowl, then wet ingredients, less 1/4 cup milk, in a separate bowl. Mix together, just enough to combine. Do not overmix. Add up to the additional 1/4 cup milk, as necessary to reach your desired consistency. Cook immediately on a hot greased griddle. They look so fluffy, yum! I love the concept of adding Greek yogurt to these! What a great way to add body and flavor! I just made these and I’m absolutely delighted. This is definitely my new favorite pancake recipe. The pancakes turned out super fluffy and light. I love that there’s no baking powder in these, because I hate the taste of it, yet they’re still super fluffy! aw, i’m so glad you enjoyed our greek yogurt pancakes! I’m so glad you love our greek yogurt pancakes!! !